The majority of your time on WordPress will be spent writing and formatting your articles- at first this may seem like a time-consuming task, but the more you do it, the easier it becomes. Below are instructions on how you go about writing/formatting a standard post. You can view all the Posts you have Published or saved as Draft in the Posts section accessible in the left-hand menu. To start a New Post, click on the Add New button on the Posts page, or the Add New link under Posts in the left-hand menu. Headlines are one of the most important elements of your article. They will help Search Engines find your story and if written well, they should entice the reader to want to click and read.Headlines are entered at the top of the Add New Post page. Headlines should always be ‘Sentence Case’ – meaning only the first word and proper nouns are capitalised. 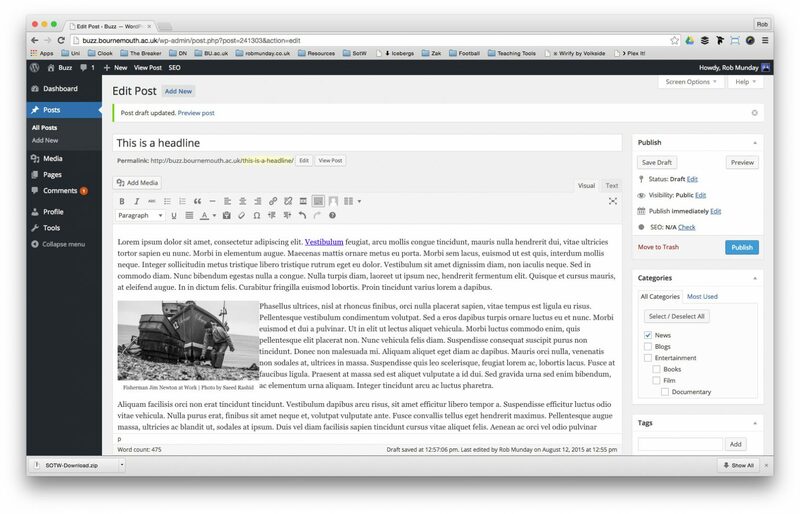 When creating a new story on WordPress, you have two editing modes available to you – the Visual editor and the Text Editor. Visual Editor: The default mode for writing. Works much like Microsoft Word – where toolbars are used to format your text. 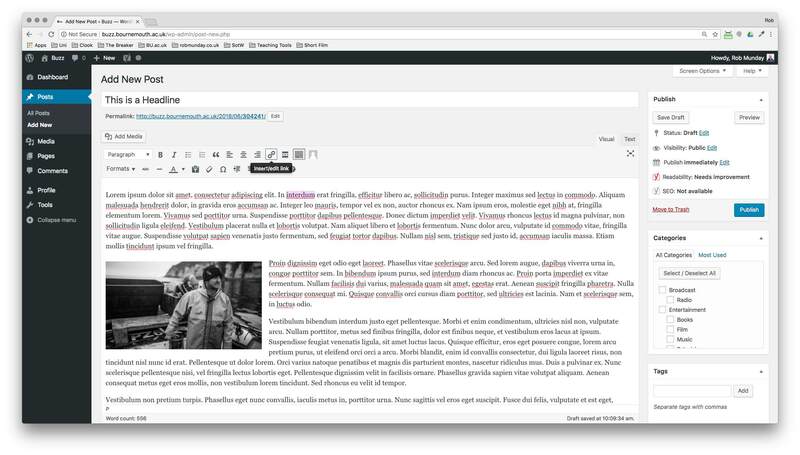 Text Editor: Allows writers to write their posts in HTML – only advisable to use if you’re comfortable with HTML. 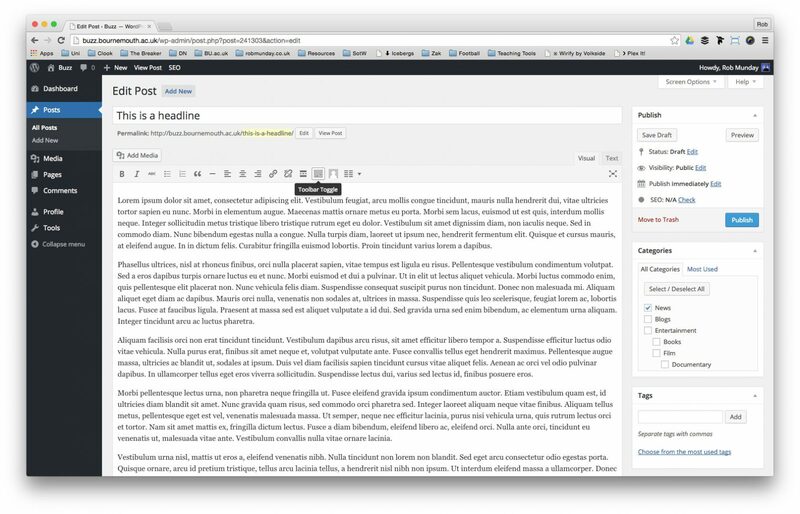 The Text Editor will prove useful when embedding content from other sites. Whilst it’s advisable to always write directly into the WordPress CMS (remembering to Save as often as possible) – this isn’t always possible (you may be somewhere without internet). If you write an article in any software outside of WordPress, whether Microsoft Word or the Notes app on your phone, there’s a process you need to follow before pasting the text into a Post. One of the main problems you’ll encounter with copying and pasting into WordPress is that often when you do this, you’ll take unwanted code across with your text. To ensure you paste just your text – be sure click on the ‘Paste as Text’ button before inserting your text. The first time you click on the Paste as Text button, a dialogue window will appear informing you that: ‘Paste is now in plain text mode. Contents will now be pasted as plain text until you toggle this option off.’ Once you click OK you are free to paste your text into the editor. 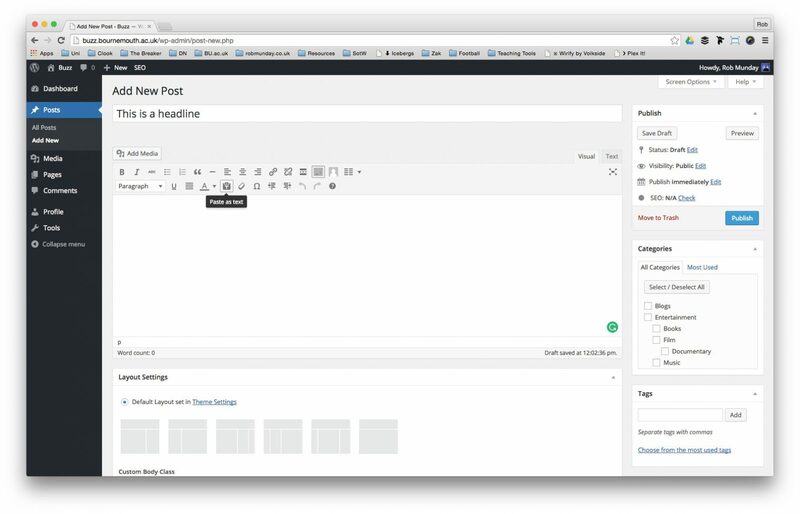 The Post editor within WordPress contains various options for styling your articles. Unless you know HTML, it is advised that you always use the Visual Editor and the buttons available to take advantage of these styling options. The first thing you’ll need to do so you can see all the styling options available is click on the Toggle toolbar button to reveal a 2nd row of styling options. 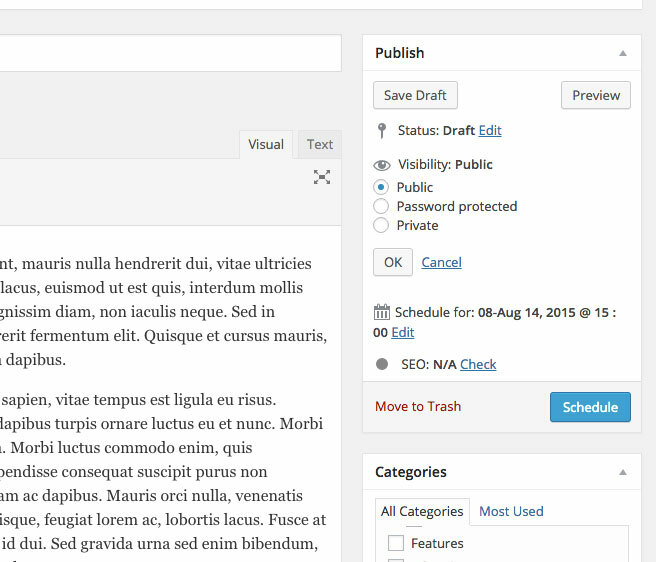 Style – The style drop-down menu allows you to change the formatting of any selected text. Bold – Add a strong emphasis to selected text to make it stand out. Italic – Italic formatting is often used online to highlight names and titles. Unordered List – Present information in a list in no defined ordered – separated by bullet points. Ordered List – Present information in an ordered list defined by numbers. Blockquote – A way of presenting/emphasing quoted text. Left Align – Align Text (or Images) to the left. Center Align – Align Text (or Images) in the center. Right Align – Align Text (or Images) to the right. 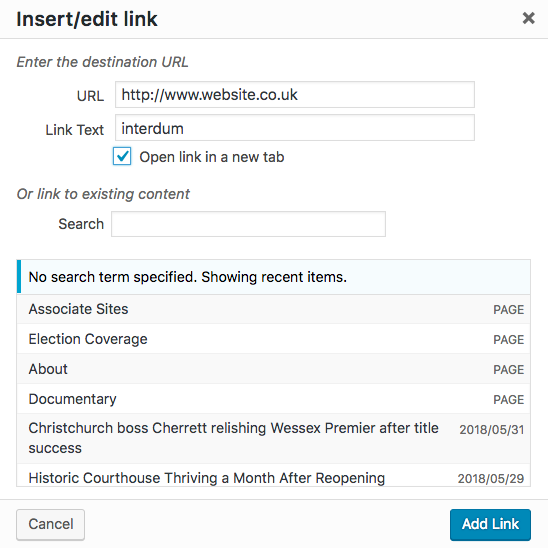 Insert/Edit Link – Used to insert hyperlinks or edit hyperlinks that already exist in your article (covered in detail below). 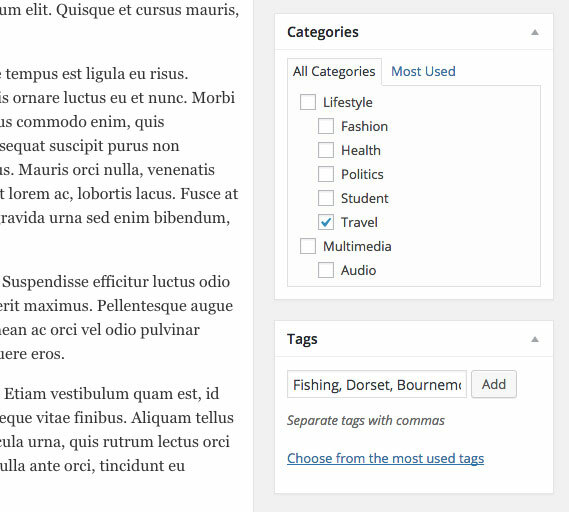 Insert Read More Tag – Decide how much of your text is displayed on the Homepage by using the Read More tag where you want the text to end (please note the read more line will not actually show within a post). Toggle Toolbar – Enables the second row of editing icons – if you can’t find some of the style buttons in this guide, make sure this button is enabled. Strike through – When used online the strike through formatting is employed to showcase highlight recently deleted information. It can also be used deliberately to imply a change of thought. Horizontal Line – Insert a line into your article, can be useful for breaking text into sections. Text Colour – Use the text colour button to change the colour of the selected text. We don’t advise using this too much, try to keep text colour to the house style unless really important to your article. Special Character – Insert a character that can’t be found on your keyboard. Decrease Indent – Move selected text inwards (to the left). Increase Indent – Move selected text outwards (to the right). Undo – Undo the last edit you made on a page. Redo – Reapply an edit after you have removed it using Undo. Keyboard Shortcuts – See a list of shortcut key combinations that can be used to make editing quicker. Hyperlinks are the backbone of the internet and the use of Hyperlinks is vital in online journalism as not only do they add interactivity to a Post, but linking to relevant websites/webpages will add context to your article. Hyperlinks can be attached to text or images – highlight the selection you want to make a Hyperlink. Once you’ve clicked on the Insert/Edit link button a small dialogue windows appears under the text/image you have selected. Enter the target URL into the empty text field and hit enter to apply the link. To see more options, click on the Link Options cog. Enter the target link into the URL field – this can be copied and pasted from the address bar of a browser window or typed directly in. Tick the Open link in a new window/tab box to ensure the target link doesn’t open in the current window/tab and take viewers away from your article. If you want to link to another article already on your site, use the or link to existing content section to search for relevant Posts. Once you’ve finished adding all the necessary information for your Hyperlink click on the Add Link button. Your Hyperlink will now have been added. If your selection was text it should have now become coloured and underlined, if it was an image you probably won’t notice any difference until you preview your Post and click on the image. To edit or remove the Hyperlink once inserted, select the linked item and click on the Insert/Edit link button. The Excerpt field in WordPress is used to provide short introductions to Posts – but please note, they won’t show on every theme. 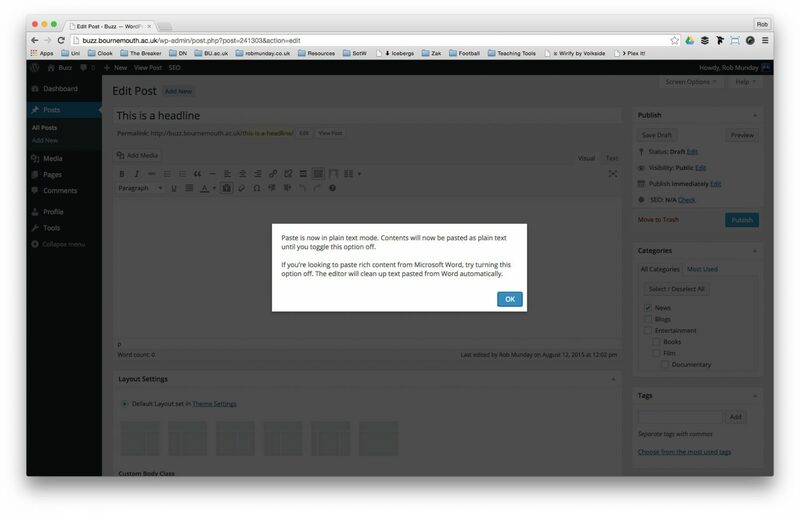 Add your text to the Excerpt field on the Add/Edit Post page – don’t exceed the 140-character limit. If you can’t see the Excerpt field, it can be turned on in the Screen Options at the top of the Add/Edit Post page. Before publishing a story it needs to be attached to a Category and assigned Tags. Tags: Tags work like Categories in the sense that they are used to group Posts together, but offer a much wider option and are generally used to describe your Post in more detail. 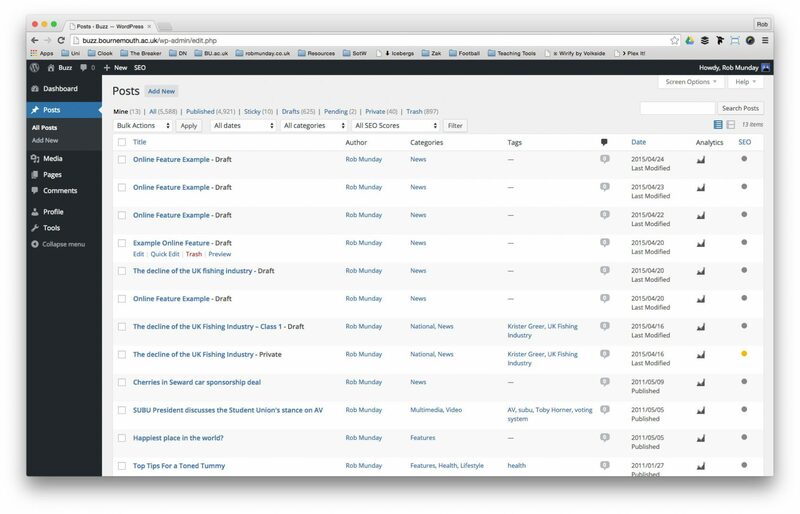 You can assign Categories and Tags to your Post at any point during the writing process. However, it might make sense to do it at the end, once the article is complete, as it may help you decide on the exact Categories and Tags you want to use. Every Post needs to be assigned to at least one Category. 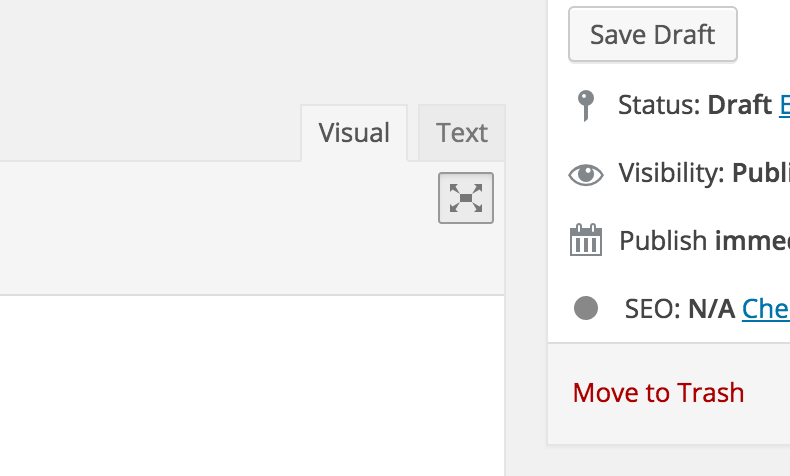 Assign Categories by selecting them from the Categories panel on the right-hand side of the Edit Post page. Tags need to be entered into the field under the Categories panel on the right-hand side of the Edit Post page. Tags should be typed into the field and separated by commas. Although there is no limit in place to restrict on the amount of Tags you can assign to a ‘Post’ – good practice would say not to add more than 6 per post. Once you have finished writing and styling your Post you have 2 options for making it live. If you want the Post to go live immediately, click on the Publish button. If you want to schedule the Post for a later time click on the Edit link next to Publish immediately. To schedule the Post alter the date and time for when you want it go live and click OK.
You should now notice that the Publish button has turned to a Schedule button – click on this to schedule the Post for publishing. 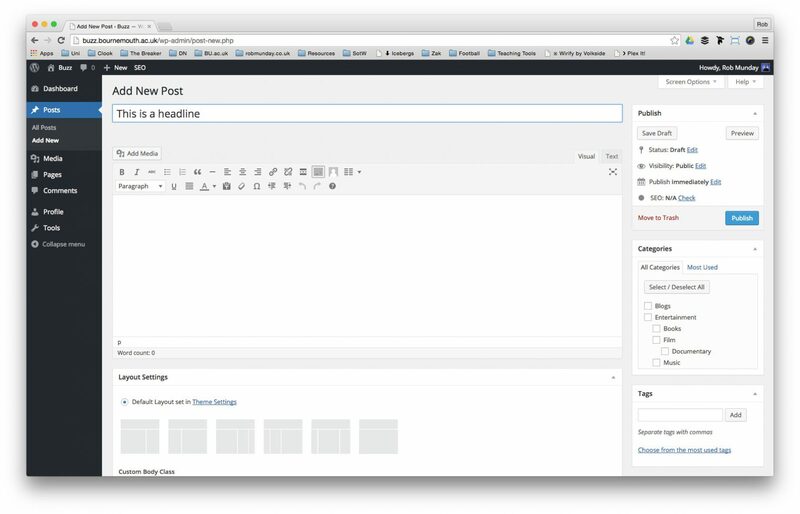 WordPress also offers options on the Visibility of your Post. Private – The ‘Post isn’t viewable to any visitors of BUzz.